Asters, autumn daisies in a wide range of colours from white, through all shades of pink and purple. Almost every garden has them and I know some gardens where they almost grow as weeds. They flower really late and give a strong splash of colour in September when most other flowers are beginning fade. They will tolerate light shade and bright sun and are relatively trouble free; what more could you want in an autumn flower. We grow, and sell, Aster novi-belgii which is grown from seed (many cultivated varieties are sterile) and seems to be one of the most reliable for attracting bees as well as other pollinators. Right now (mid September) my asters are the buziest thing in the garden. Alliums Roseum and Unifolium because, although less dramatic that the large purple pompom type, they produce many more flowers and their bulbs reproduce readily so that you get a nice 'drift' beween your other plants. We mix the two as they are very similar but together you get a longer flowering period. Allium Sphaerocephalon - not easy to say but otherwise known as the 'drumstick' allium. Tall (80cm) stems with an egg shaped flower of deep pink and green florets. Allium Nectaroscordum - Scicilian honey garlic - is a later flowering stately allium with very large (15cm) drooping flower heads in pale pink/green shades. Stunning! At rosybee we plant about half an acre of borage each year, just because its so good for the bees. Its particularly loved by the honeybees - so I am hoping its boosting our honey - but we see plenty of bumblebees on it too. For this season, I sowed a large section last September and it over-wintered well and started flowering in April. Now it is nearly over but the spring sowing should start to flower in a few weeks. The honeybees go for the nectar and the bumblebees appear to collect both nectar and pollen, the latter being very pale, almost white. Each week I try and pick as sunny day and count how many bees/ square meter. The average has been about 6 bees with a ration of 5 honeybees to one bumblebee (mainly bombus pratorum, hypnorum and a few laidarius and terrestris.) Because of its sheer attractiveness and the number of weeks of flower, those two factors combine to make it one of the best bee-plants we have found. We will combine these stats with the results for all the other plants we grow and aim to publish a ranking towards the end of this year. * Think about the sunny areas of your garden (some bumblebees will forage in shade but most bees prefer sun) and consider how you might fit in some more flowering plants: do you have flowering shrubs and perennial plants rather than annuals? or do you have room to fit in a few more of the best flowers or substitute some plants that are not providing enough value? * If you are short of space then one way to fit in more plant is to try 'succession planting' which means that you plan to have one set of plants that flower early and then another that flower in the same space later. In this way you can have bulbs like tulips providing pollen in April, followed by an Oriental Poppy in May/June and then a later flowering daisy like Echinacea or Rudbeckia in August - all in the same space. You are very welcome to email us for advice. We grow agastache foeniculum from seed collected from our own plants and both honeybees and bumblebees love it. The first central spires of flowers started to bloom at rosybee in early July when it was still hot and dry. Then in the last two weeks the secondary spires have matured and a second wave of purple is now added to the first. This plant smell of licorice but is actually a member of the mint family (they could have a whole sweet shop going on here!). Its also a great plant for 'bee watching' because the spires have many tiny flowers and the bees work their way systematically and slowly around the flower spike in a fairly upright position. This typically means the bees stay 'posed' on the flower for at least 20 seconds, and are still enough to allow identification. I was recommended to visit Sussex Prairies by a friend who is also deeply into bees who said that the plants range they grow results in a great display of bees as well as flowers. Oh boy, was she right! Knowing that they specialise in a style of planting that is meant to evoke the American prairies, we chose to visit in August when many of the native american prairy plants - echinacea, rudbeckia, helenium - are at their best. I have to say it was sensational with its giant sized, sweeping borders, planted in blocks of between 30 and c.100 plants at at time of the same species. The result is bold blocks of colour , height and texture. 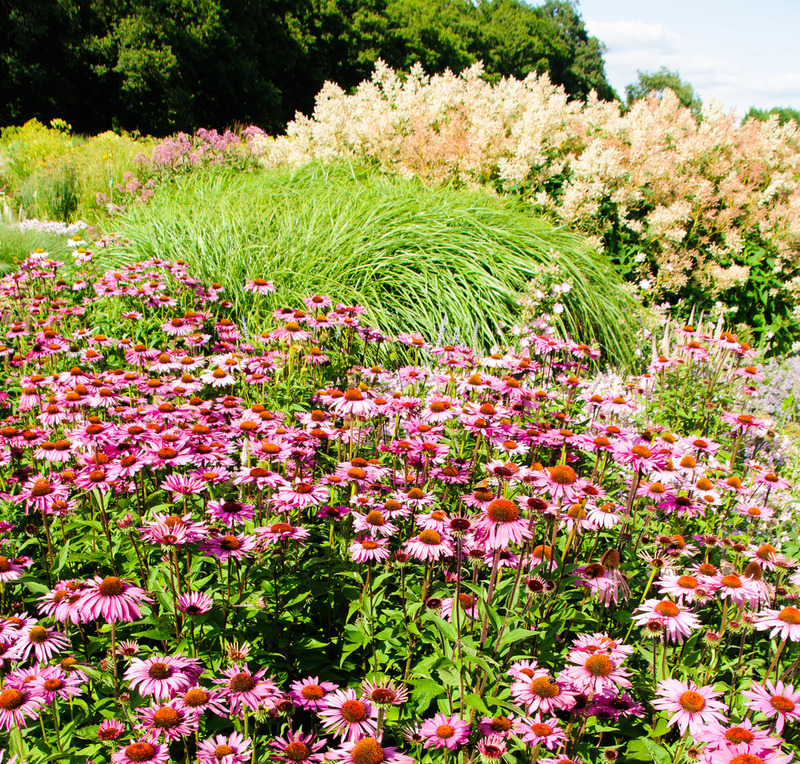 The bees were particularly drawn to the echinacea (pictured) and veronicastrums which were a mass in full bloom. We took the opportunity to increase our stock of bumblebee photos and where delighted to add some species we had never seen before including southern cuckoo bumbles. 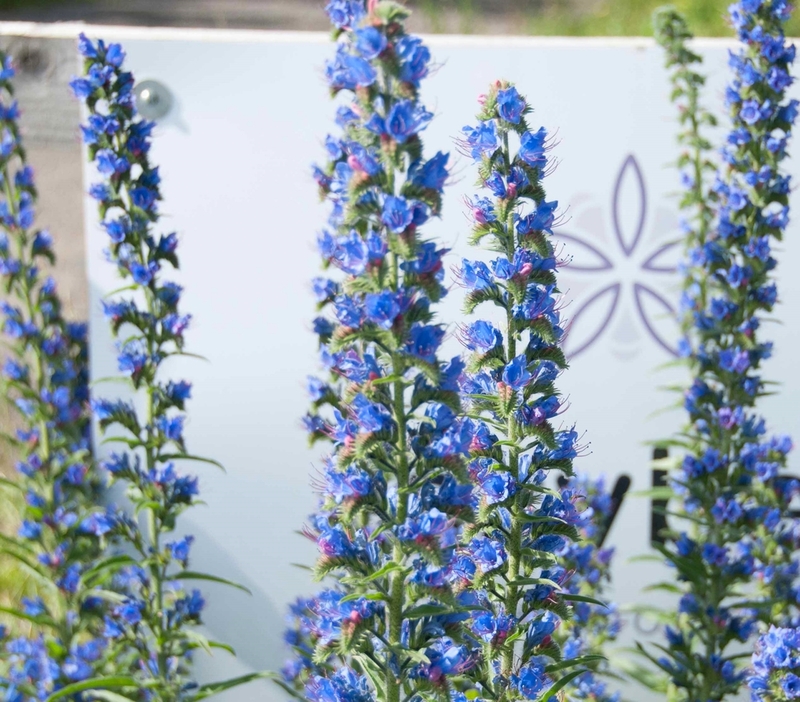 Hyssop appears to be a forgotten shrub; you don't see it in garden centers or mentioned on the TV gardening shows but it really is a very valuable plant both for bees and gardeners. Hyssop is a sub-shrub which looks and behaves a bit like lavender but unlike lavender does not tend to go 'leggy' so quickly. From July til September it bears a series bright blue flowers along the full length of the new growth forming a compact ball of blue. The bees go crazy for it and this week I counted more bees on this plant than any other on site; up to 18 per square meter, which is extremely high. This seems to attract all types of pollinators: honeybees, bumblebees, carders, moths and butterflies, hoverflies, and some solitary bees. Its categorised as as herb and supposedly good in casseroles, a bit like thyme but I cannot say I have tried it ...yet. Our native meadow species have evolved to finish flowering before the hay is cut in June so August can be a tough time for bees. In America, there are still vast expanses of natural, uncultivated, prairie land which are the equivalent of our traditional meadows; swathes of grassland containing patches of flowers. These daisies are native to the prairie landscape and provide very welcome nectar until the frost begin. Try this collection and maybe add veronicastrums too for real autumn drama in the border! This border was planted in June last year and as you can see it is now a mass of colour with very little bare earth showing. We put in 12 trays of our plants in an area 4m x 6m - which equates to 5 plants per square meter. This is a little denser than I recommend and will probably need to pull some out at the end of this season to all more room for growth. But it does show just how quickly they grow and how colourful great they look. Oh, and the really good news is; lots of bees. 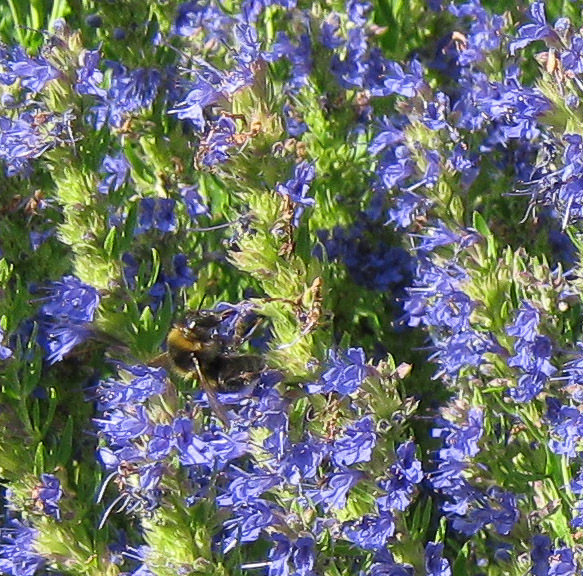 We get an average of 3 bees per square meter on a sunny but it does vary by plant. We will continue to monitor and have more stats on this later in the year. Commonly know as catmint, this is a family of around 250 species. I find this amazing as you are lucky if most garden centres even stock one! They originate from southern Europe right across into Asia and are found in hot dry conditions. The normal garden catmint is racemosa or mussinii which loves a sunny spot and will form a mass of soft grey foliage up to 1 meter accross and will flop casually; looks great over a low wall or at the edge of a border spilling onto gravel. We also stock the smaller nervosa which is a bit more shrubby and has greener leaves. This is more contained in a smaller space. Bees (and cats) love it and you will see the whole range of short-tongue varieties (bumblebees, carders, mason and honeybees). The reason cats go potty is it gives of a scent that has a weird effect on them like a temporary 'high'. Campanula lactifolia - great mass of leaves to 1m with a ball of pale pink bell-flowers at the top of the flower stems. 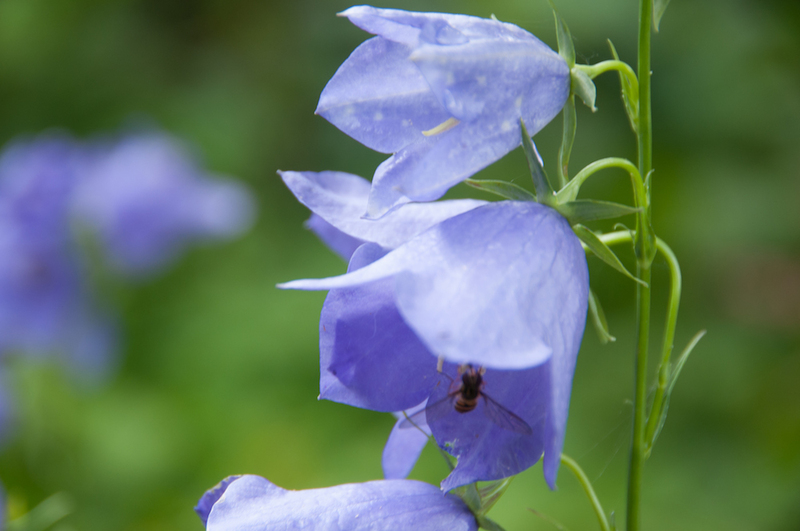 Campanula rotundifolia - our native 'bellflower' which grows wild in Scotland but does not require acid soil. Its is a smaller plant - 30-40cm and will be quite happy at the front of a border, in a rockery or even a pot but do not overwater.